Today’s guest is Tami Gaitten, an integrative nutritional health coach with over a decade of experience in the IT field. I didn’t know anything about integrative nutrition health services before this conversation, and I learn a lot. Tami went back to school again in 2013, this time to study Functional Nutrition, which looks at the person as a whole and how all of your system are intricately connected. It also looks at each person as being incredibly unique, so no two people with the same diagnosis or the same problems are going to be helped by the same protocol. Everybody has variations in their genetic makeup, what type of problems they may be working on, and the makeup of the bacteria in their gut can be different. As a coach, Tami didn’t just learned physiology; she also learned how to listen. Whenever she begins coaching a new client, they begin by talking. “I listen to their lifestyle, I listen to their background. There’s a lot of stuff that comes out of their history when they talk.” Then they track their lifestyle in a food-mood-poop journal. One thing that Tami teaches is that we should be eating with the seasons. “Nature is designed to provide us the foods that we need in the season that we’re in.” In spring, you eat leafy greens that are designed to help your liver, to help clear out the sludge from the winter. In the summer, you eat more greens and fruit to keep energy up. As you head into the fall, you’re eating more of the root vegetables. Those things are designed to ground you and get you ready for winter. In winter, we eat more beans and spices: things that are soothing and warming. Tami is a one-stop help desk for your health. I learned a ton from her today, and I hope you did too. I hope you reach out to her and learn how to start upgrading yourself. 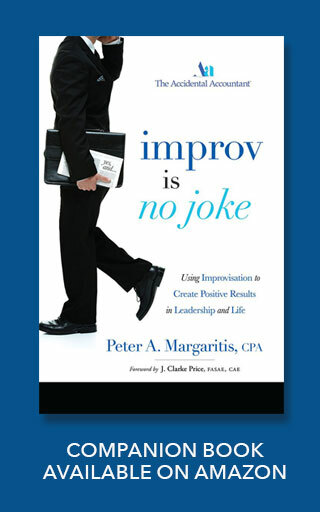 Peter: Also, if you’re not signed up for the SN challenge, please go to my website PeterMargaritis.com and scroll down to the SN challenge call to action ,and click to register to begin building the effective habit of “yes and,” and the principles of improvisation. And remember to share your experiences on Twitter using the hashtag #yesandchallenge, or on the Accidental Accountant Facebook page. Now, if you’re not sure what the SN challenge is all about, please go back and listen to episode 0. This is where we discuss the SN challenge in more detail. Peter: This week I would like to share with you an article that was published in Crain’s Cleveland Business titled, Medical Improv Putting Physicians to the Test. The article is the first of Dr. Karen Chan, a first-year resident at University Hospitals, was looking for a research project last fall when a mentor suggested that she combined her longtime hobby of improv with her medical work, something she hadn’t thought about before. 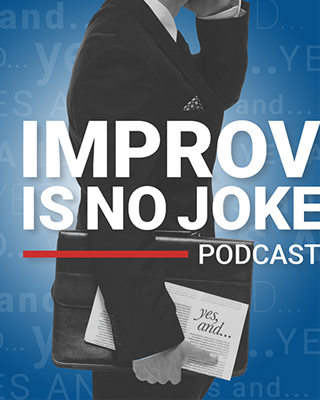 Soon she began using improv as a tool when something was going wrong in a conversation with a patient. She says, “Patients who are really angry at me for whatever reason, I’ll try to calm them down by trying to find something to actually agree on,” Chan said. “So that’s the first rule of improv: ‘yes, and.’ It’s hard to argue with someone if you find something to agree on.” She did more to develop a curriculum, and in February began teaching her fellow residents on how to apply improv into the work. In addition, the Cleveland Clinic has also incorporated medical improv into its communication training. This is great advice, and it applies whether you’re dealing with an angry patient, an angry client, an angry employee, an angry spouse. I’ll put the link to the entire article in the show notes. Well okay, it appears that I have completed my to-do list, so without further ado, let’s get to the interview with Tami Gaitten. Peter: Tami I greatly appreciate you spending time with me today on my podcast. Thank you very much, and I’m so looking forward to our conversation. Tami: Me too Pete, and thank you for the opportunity to be here. It’s really fun. Peter: I’m looking forward to learning more about an integrative nutritional health coach, what you do, and how you help people become healthier in their lives, and the first question I’d like to ask is: tell us about yourself. Give us your background. Tami: Well, I didn’t start out as a health coach. Actually, when I graduated from high school, I went to college and my father suggested that I major in computer science, because that was the wave of the future back then, and think it still is. Tami: So it really wasn’t my thing, but I went ahead and followed his advice and got my degree, bachelor of science in management information systems, and got a job right out of college, which was a really good job, well-paying, so my father was a smart man [laughs] But I worked in corporate IT for 16 years. I’m actually it got very crazy. I had a stressful job. I was writing programs probably for the first three years in COBOL on punch cards, if you can imagine. You know that gives you some idea how long ago this was. Peter: Oh, I remember punch cards. Tami: Back then my husband was also working an IT job, and we were juggling schedules. We had four children, and when my youngest was born in 2003 things were just really nutty. I was coming home from work, trying to get the kids and we were going out, and eating chicken nuggets and french fries, and coming home trying to get them bathed and in bed, and then I would dial back in and probably work till two o’clock in the morning so I could complete my projects. I had moved from being a programmer to being a business analyst, so I was kind of a liaison between programmers and the end users. I was designing a lot of training materials and traveling, and I actually I loved that part, when I got out of programming and was actually working with people. That was more my thing. Tami: But by the time that fourth baby came along, we were pretty broken. Tami: And I’m like, “What’s going on?” You know, I’m eating well, applying all these things I know, and I’m falling apart. Tami: So again I went back to school in 2013. I had come across functional nutrition, which is a really interesting concept because it looks at the person as a whole, and how all of your systems are really intricately connected, and It also looks at each person as being incredibly unique, so no two people with the same diagnosis or the same problems are going to be helped by the same protocol. Everybody has, you know, variations in their genetic makeup, what type of problem that maybe you’re working on, and also the makeup of the bacteria in their gut can be different. As a coach, what I learned is that, you know I’m studying physiology – how things are all connected – but I also learned that it’s really important to listen to your your client ,and to find out what is going on with them. Then from there you can move forward and create, you know, a plan or protocol, or an action plan that’s gonna work that they can start with. Tami: Sorry that was kind of long, wasn’t it? Peter: No, that was very interesting. I’m still dwelling on the fact that you spent 16 years in IT, but I think about it: you’ve transitioned yourself from that corporate stressful environment into a role that now you’re trying to help those in the corporate world on how to become more healthy. How to deal with all the stress that we’re under, and it’s an interesting journey. Tami: It’s been a very interesting journey, and you know, as I look back, I can kind of connect the dots between some of the things that I did as a liaison between programmers and end-users, I’m now doing with how to get healthy. It’s all very complex with nutrition, and it can be confusing, and there’s so much conflicting information out there. How to to help somebody figure out what’s going to work for them, and then put it into a plan that they can understand, it’s a kind of a discovery process too that we work through. But yeah, I look back and I see how what I was doing when in the corporate world applies now to the clients that I work with, and also the presentation skills when I was doing my training and traveling and documentation. Those skills have all come into play as I work with corporations, because I can go in and I can present information in an easily understandable way. I know what these people are going through, you know, when I go in and do a lunch and learn I can talk about stress, and you know, how do you mitigate stress? How can you eat to fill yourself? How can you nourish yourself with healthy foods? How to eat for energy, you know, those types of things that are really helpful for people that are in that corporate lifestyle. Peter: So what what advice would you give someone, a novice? I needs to hire you, and as you said we’re going to co-create this program. Now what would be one of the first things you would have this person do? Peter: [laughs] Okay, wait. I have to hit rewind there. [tape rewinding noise] What was was that again? Tami: [laughs] It’s a food-mood-poop journal. So, just for a couple days, we kind of look at what is coming in, how they’re feeling, and what’s going out. It’s a diagnostic tool, again coming from a computer background, and the systems and logistics type of mindset that I have. I like to see, you know, what they’re eating, and it’s not about counting calories, and it’s not about any shaming, it’s just let’s see what’s coming in. Let’s see how you feel and let’s see what’s going out. That way we can start to look at, you know, foods that you might be sensitive to, or things that might be triggering agitation or fatigue. So that’s kind of been the starting point. We take a look at that, and then we make a plan together of what things we’d like to address. Tami: Yeah, exactly. Breathe, slow down. But I also notice, I mean what screams at me right away, would be the missing plant foods. Like, where’s the color, you know? Where’s the green and the red and orange and the yellow and the blue and violet? That’s one of things I address first with people too, is increasing the plant foods. Peter: But yeah, that’s true. Plant-based diets are better for you, being a type 1 diabetic I have – and I read the book The China Study – and actually I did change my diet, at one point probably more than ninety percent plant-based. Fruits and vegetables and all that, more than anything else, and it was great. I could feel a difference, but the thing that always trips me up is the holidays. Tami: Oh yeah, and I think you have to you have to be gentle with yourself and just know that, you know, those are times when you may be my getting off the highway a little bit. You may be taking a few detours and things. You just have to know how to get back on. You don’t beat yourself up about it, but you know that you’re going to get back on and take care of yourself. Peter: So that comes to be New Year’s Eve, and I make a New Year’s resolution that I’m gonna get back on the train again, and I’m on the train and just like everything else we do as it relates to New Year’s resolutions, by February 1st I can’t even spell resolution, and I I’m not maintaining that habit, so what advice would you give someone who’s having a hard time? I think everybody does this. We all set diets, we all set plans, but then we fall off the wagon and we end up going back to our old ruts. What advice would you give on how to stay on track? Tami: It’s just the little things, you know, it doesn’t have to be an overall big diet change. Just starting to make little upgrades, and add in, and that’s one of the things I work with people is how to make it easy to to get more plant foods into your diet. Just like adding in a smoothie in the morning, you know, or taking a walk at lunch. it doesn’t have to be a huge, big deal, but these little things add up. They’re like a snowball effect. Once you start doing one little thing, you get motivated and you start to feel a little bit better, and then you suddenly have a little bit more energy, and then that motivation and energy coincide to, you know, push you forward. And then a coach comes into play, you know, and that’s where the coach is helpful and saying, come on, you know, take my hand and we’ll walk through this together. I’m gonna be a little inspiration and motivation. Peter: I find it interesting that, coming from the IT background, you use the word upgrades. So I’m going from Pete 2.0 to 1.1 to 1.2 to 1.3. The add-ons. But that does make sense. It’s just taking the little bits, and I’m a firm believer – in a conversation on the Dan Forstyhe podcast about if you want to get better at doing something, and you need that help, hire a coach. Don’t look at it as a cost, look as it as an investment in better health. It’s always been my mantra that, if I want to become the best or try to become the best speaker possible, I’ve hired two or three coaches. Getting different opinions. But I’m a big believer in hiring a coach. One, to help you maintain those habits, but as we’re sitting here talking – and this episode will most likely be aired and in September – and we’re right here at the end of, well we think it’s the Spring, I’m not sure if that fits with the weather – do you coach about nutrition for the seasons? Is that even a thing? Tami: Yes it actually is a thing, and in fact I coach, too, that we should be eating with the seasons. You know that nature is designed to provide us the foods that we need during the season that we’re in. So in the Spring, you’re eating the leafy greens that are coming up and they’re giving you energy, and they’re like the dandelion greens and things, although a lot of people don’t need those. They’re designed to to help your liver, to help clear out the sludge from the Winter. And then of course, as you head into Fall, you’re eating more of the root vegetables and those things are designed to kind of ground you, and to get you ready for Winter. So yes, I think that that is definitely a thing, and I think that we should be eating with the seasons also, because that way we’re eating the freshest food possible. You know, what is being produced in your area locally at that time of year. Peter: So if Spring is greens and stuff, what’s Summer? What should we be eating in Summer? Tami: So, again, it’s a more greens. A lot of fruit. Fruits and fresh vegetables that are in season. Here in Ohio lot of the stuff you know isn’t ripe until toward the end of August, but definitely fruits. Peter:: What we should eat in Winter since it is cold and snowy? Tami: Basically, you know, your soups, you’re warming foods, and looking at spices: your cumin and turmeric, and again the beans and things that are soothing and warming. What I typically talk about for Winter goes along with common sense, you know, what you’re used to eating or what sounds good to you that time of year. Peter: And soups do sound good to me that time of year. I do make a lot of soup during that time of year. I know you’ve got a number of clients. When you go into an organization, and they hire you, can you describe that process and what you do? How you set up your programs for maybe a larger audience? Tami: Well one of the things I do for corporations is participate in their wellness events. A lot of times they’ll have wellness days, where I’ll come and I’ll have a table and talk about what I do, you know, as their employees comes through, and then I also provide lunch and learns, and then sometimes the lunch and learn is on the same day as the wellness event, and that can be tailored to what their employees, or may be interested in hearing about. I’ve done lunch and learns on sugar, ways to reduce your cravings for sugar, and also lunch and learns on how to eat for energy. Lunch and learn how to get more plant foods into your diet. Then the other interesting thing I started doing is what we call coaching days. So I will go into an organization for a day, and they have employees that have signed up for 30-minute health coaching sessions with me, and basically in that 30-minute session they come up with whatever their main role or challenge might be the time, and I can give them some tips on moving forward, and then I followed that up with notes afterwards so they can have a review of what we talked about. Peter: What do you do with your long-term clients, and what is the length of time if I said I want to hire you to help me become better, and it’s not going to be like shell out 1-shot deal. I really need your help. What is the average length of time that you’re spending with your clients? Tami: Usually three months. I mean that seems to be, and a lot of times the three-month client will extend for another three months just because it’s nice for them to have that person there. Every other week is typically how often we meet, and you know during that time we will decide on what they want to work on for the next time, and put together a plan together for the next two weeks. But I do offer one-time sessions, if somebody just needs some tips or something to get them started, then there’s the three-month program. Six month. But basically it’s designed for the person, so if somebody doesn’t need that much, and if they just want one month, we can do that. Tami: Working with somebody, when we’re in a three-month program or six-month program, they have access to me every day, so it’s not just when we meet to talk. You know whether it be a Skype call, on the phone or in person, it’s not just during that session but every day they have access to me via email. So anything coming up, any questions they have, I am their support person and their advocate, I’m their friend. I’m in it with them, basically, you know, we’re doing this together. Peter: – you’re still providing some type of follow-up to them in order to keep them motivated and moving forward. Peter: That’s great. I’m learning a ton today. Tami: [laughs] We can have another call about that. Peter: Now, Is that journal only done the first couple of weeks? Tami: Yeah, basically it’s just a diagnostic tool so we can see what some of their triggers might be, where we might be missing some foods that can be helpful, and like I said, it’s not about calories. I’m not a calorie counter. It’s more about learning to nourish yourself well with whole foods. I’m an educator, you know, I like to help people understand why those foods are important, and what’s in them. The plethora of nutrients that are In plants is just amazing, so when you can show somebody what’s missing, and why it’s important, and how it may help them to feel good, then that’s the beauty in that Journal. Peter: That’s great, because I think of my audience, and for the audience that will continue to grow over time, that we’ve got a lot of business leaders and hopefully a lot of CPAs, and if there’s a profession that is equally as stressful. Not anymore year-round, but at those peak seasons, I can still remember being in the firm – this is years ago – and Wednesdays was pizza night. And Monday was, you know, they would have breakfast force. Tuesday was ice cream sundaes and stuff, and working these long hours, and I’m thinking, after listening to you, it should have been something completely different. Some type of food to help give you more energy, versus make you sleepier. Peter: Hey, and nobody likes their tax accountant sleeping when they’re preparing your tax return. Tami: It all happens for a reason, but yeah, there’s a lot of things you can do. Peter: Well great, as we wrap this up, we will do the rapid-fire session with you. Peter: This is not painful, and this is tailored to you, for the most part I beleive. Peter: So the first question: chardonnay or chianti? Peter: What’s your favorite book? Tami: Living With Joy. Peter: What’s your favorite vegetable? Tami: oh gosh, that’s a hard one, it depends on what season it is, how’s that? [laughs]. Peter: [laughs] Alright, it’s Spring. Peter: And since this will probably air in the fall? Tami: Oh, and sweet potatoes. Peter: You have to say sweet potatoes? Peter: That’s one of the ones I’ve never been able to stomach, is a sweet potat. Peter: Yeah, I know that’s strange. Tami: I’ll have to fix you a sweet potato. Peter: Little punch cards or hanging chads? Peter: What’s your favorite song? Tami: Oh no, another hard one. Actually, “Adelvice,” from The Sound of Music. Peter: Okay. Justin Timberlake or Beyoncé? Peter: Favorite plant? Favorite plant that deer won’t eat? Peter: And what’s one thing on your bucket list that you haven’t accomplished? Now that you can check my podcast off of your bucket list. Tami: Oh my gosh, my bucket list is long, but I would not to go to Italy. Peter: And I I’ll tell you something I told Tom Hood: Go. Mary and I went, I think we’re going on seven or eight years ago, and it was the best two weeks that we’ve ever spent out of the country, and we both have been to Greece before, and we even kid each other nowadays that, if we were going to go international, it would be a hard pick between going back to Greece and going to Italy, and yeah we would probably have to flip a coin. That’s three out of five or something. Tami: [laughs] Yeah I definitely want to go. There’s lots of places I want to go, but that one is top on my list. Peter: So tell my audience how they can find you. Tami: You can find me on my website at www.GaittenWellness.com or email me at Tami@GaittenWellness.com. Peter: And I will have her contact information on the show notes, as well as the transcription. Peter: You’re welcome, and thank you for taking time to spend with me. I really enjoyed this conversation, and I know my audience. If they listen to it, hopefully through either call you or start making changes in the way they interact with nutrition in order to become a healthier and more energized person. Tami: And I would love it if they want to give me a call, or if they’ve just been inspired today, that’s my goal. So that’s great.